The popular story of Robin Hood immortalized by Hollywood is based on a play written by Shakespeare’s contemporary Anthony Munday in 1598. It tells the tale of a disinherited English nobleman who leads a band of outlaws in their fight against the ruthless Sheriff of Nottingham from the depths of Sherwood Forest. The story is set in the 1190s when King Richard I is away fighting in the crusades and his brother Prince John is left to rule England in his place. 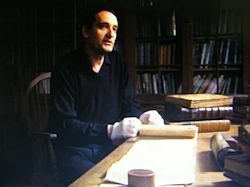 Most historians who had previously searched for evidence of historical truth behind the story examined records from the reign of Richard I. As nothing conclusive was found, many believe that Robin Hood was nothing more than a myth. However, in Robin Hood - The Man Behind the Myth, Graham Phillips and Martin Keatman uncover evidence of an historical Robin Hood from an entirely different period. Graham Phillips examines the archives of Wakefield Manor that revealed the existence of an historical Robin Hood. The War Memorial at Wragby, where Robert Hode’s manor once stood. 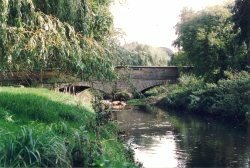 The old bridge at Wentbridge. Here the historical Sherwood outlaws robbed the merchants who traveled the road from Nottingham to York. The reason others had failed to discover this elusive documentation is that, based on mistakes made by Anthony Munday, they had been researching the wrong dates. In the vaults of the British Library in London there survives a tale of Robin Hood written 200 years before Anthony Munday’s time. It is an anonymous work entitled A Gest of Robin Hood that first appeared in print around 1500 but seems to have been composed in the mid-to-late 1300s. The word Gest was a medieval word meaning a story or tale so, for convenience, the work is referred to as the Gest. Literary scholars had long known of the Gest’s existence, but many historians overlooked its importance as evidence for an historical Robin Hood. Significantly, it places the story in a different time to Munday’s play. It is set in the early fourteenth century and not the late twelfth, and the king is not Richard I but Edward II. Neither is Robin a nobleman, but a soldier - a knight in the army of Thomas the earl of Lancaster. The action takes place in 1322 when Robin is forced to become an outlaw after the earl of Lancaster leads a failed rebellion against the king. Lancaster’s rebellion was an historical event and the records show that many of his defeated followers did flee into Sherwood Forest to continue a guerrilla campaign. The earl of Lancaster had been the lord of both Nottinghamshire and Yorkshire and had led a popular uprising against unfair taxes imposed by the king following a crippling famine. Unfortunately, Lancaster was betrayed when his plans were revealed to the king by his trusted deputy Henry de Faucemberg. When the rebel army was defeated at the battle of Boroughbridge in Yorkshire on 15 March 1322, Lancaster was killed and the king rewarded Henry by appointing him sheriff of Nottinghamshire and Yorkshire. He was charged with rounding up the rebels that fled south into Sherwood Forest. Henry, it seems, became the fabled Sheriff of Nottingham. The possibility that this Robert Hode was the historical Robin Hood was supported by the names of other outlaws recorded as being in his band. For example, a man who went by the name of Little John is recorded as being buried in nearby Hathersage churchyard where his grave can still be seen, and a Friar Tuck is recorded as Lancaster’s chaplain who took part in the revolt. Robert’s wife was even a perfect candidate for Maid Marian. 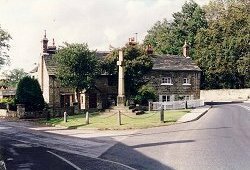 Before he was outlawed Robert had been a relatively wealthy knight who lived in modest manor on the edge of Barnsdale Forest in what is now the village of Wragby, a few miles south of Wakefield. In 1321 he married a girl from the nearby village of Woolley named Matilda. In Anthony Munday’s play Matilda had been Maid Marian’s real name: the name Marian being an alias she adopted once she had fled into Sherwood Forest. Just as in the legend, Matilda Hode joined her husband in the forest and, remarkably for the time, had actually played an active part in the struggle. 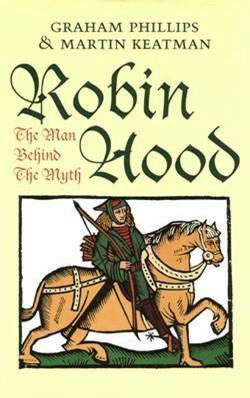 All this provided astonishing confirmation that Robert Hode was indeed the historical Robin Hood. The royal archives, dating from the reign of Edward II at Winchester in southern England, reveal that the Sherwood outlaws were eventually granted an amnesty by the king in 1323, in return for their support in putting down a new rebellion. Two years later, with the rebellion behind him, Edward had a change of heart. Robert and his followers were once again outlawed and disappear from record. Graham and Martin could find no historical evidence of what became of Robert Hode. 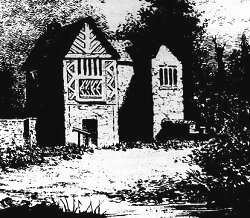 However, the Gest says that Robin Hood was eventually murdered by the abbess of Kirklees Priory in Yorkshire when he sought sanctuary there in 1347. Why the abbess killed him is a mystery as the surviving manuscript is damaged and the verses pertaining to the betrayal no longer survive. All we learn is that, after killing Robin, the abbess took her own life and Little John arrived to bury his friend’s body nearby. Kirklees Priory historically existed and an abbess – one Elizabeth de Staynton - is recording as dying there in 1347, the very year that the Gest says Robin’s murderer died. More remarkably, the grave of a "Robard Hude" - perhaps another medieval spelling of Robert Hood - was discovered in woodland nearby. The original is no longer there but in 1665 an antiquarian named Nathaniel Johnston made a drawing of it and that still survives. Today a crumbling nineteenth-century monument marks the spot, bearing an inscription that claims it to be the actual site of Robin Hood’s grave. In Robin Hood - The Man Behind The Myth, Graham Phillips and Martin Keatman retrace the life of the historical Robin Hood, even identifying the very place he robbed the rich to help the poor at a medieval bridge at Wentbridge on the old road from Nottingham to York. The gatehouse of Kirklees Priory as it still existed in the 19th century. English edition: HB Michael O’Mara 1995. Translations: Heyne (German), Temas `de Hoy (Spanish), Piemme (Italian).